Kitchen! Kitchen! : a minchi what?! !.....at kitchen! kitchen! My version of Macau's national dish called minchi. in Macau over 400 years ago. 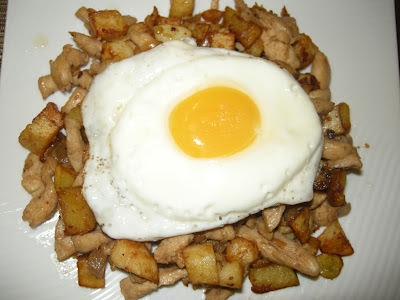 ground beef or pork topped with a sunny side up egg. to accomodate the ingredients that I currently have in my pantry. it's much better and delicious! A very HOT WOK - stir fry the garlic and onions until golden, adding the meat. Season with salt and pepper ( I used fish sauce) and a dash of soy sauce. set up the stir fried on a plate; cook a sunny side up egg and slide it on top of the dish.